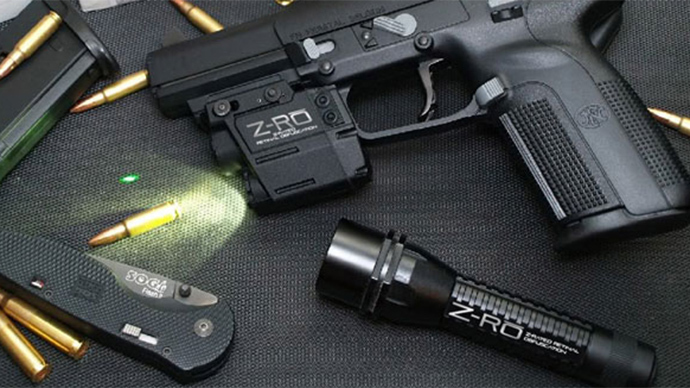 The United States Department of Homeland Security may require the local police forces it supplies with military-grade weapons to repay federal anti-terrorism grants should the items be used to suppress dissent. A representative of the DHS, one of three federal agencies responsible for allocating military equipment to local police forces, indicated during the first congressional hearing devoted to the last month’s civil unrest in Ferguson, Missouri that the department is considering demanding that grant money be repaid should weapons be used to tamp down protests. “We have a range of remedies should [the Dept. of Justice] find non-compliance, including recoupment of funds,” Brian Kamoie of the Federal Emergency Management Agency, or FEMA, told Sen. Rand Paul (R-Kentucky) of the Senate Homeland Security Committee during a hearing on Tuesday this week in Washington, DC. The US Department of Justice and the White House are investigating the possibility of limiting federal programs that have distributed an immense amount of local law enforcement agencies with armored vehicles and other military weapons in the aftermath of the September 11, 2001 terrorist attacks. 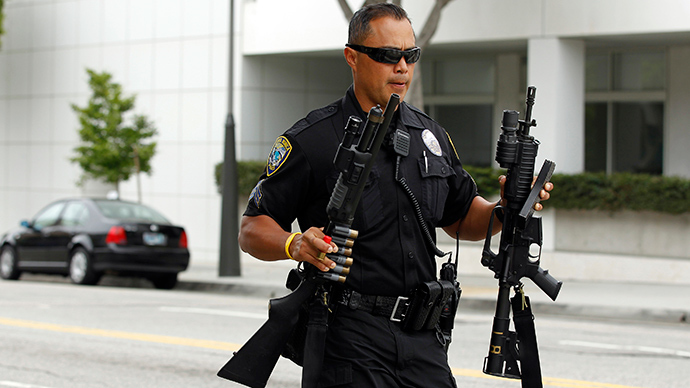 One way the US government distributes military-grade weaponry to local police departments is through the Department of Defense’s 1033 program, in which the Pentagon offers hundreds of millions of dollars in surplus military equipment to police forces throughout the US. For instance, St. Louis County, which encompasses Ferguson, is part of the program, as RT has reported. Ferguson became the focus of law enforcement militarization, among other issues, following the killing of an unarmed black teenager by a white police officer in August. 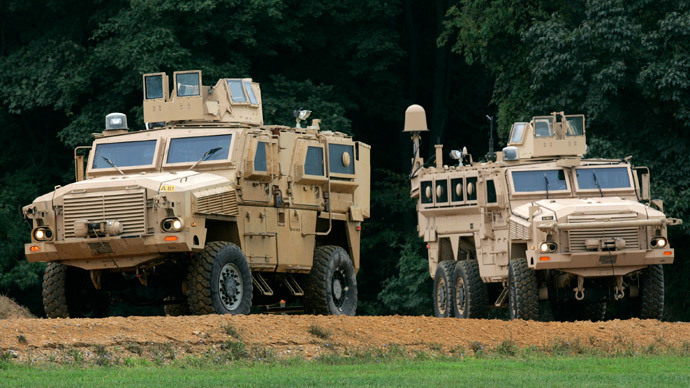 The 1033 program has provided 12,000 bayonets, 5,200 humvees and 617 mine-resistant ambush protection vehicles (MRAPs) to local police agencies, according to The Guardian. Close to 200 state and local police departments in the US have lost military-level equipment transferred to them by the Pentagon’s 1033 program, according to a recent independent investigation. Pentagon officials at the Senate hearing on Tuesday acknowledged that there were few central controls for their program, and that local law enforcement and states decide what weaponry is needed. Karol Mason, assistant attorney general at the DOJ, also said her department’s allocation of grant money for military-style weapons comes with “very little discretion.” Mason said the DOJ has spent $4.5 billion on weapons for local law enforcement since 2005. In response to national outrage over the utilization of military weaponry by police in Ferguson - which is emblematic of police forces across the nation - some in Congress have mulled stemming the flow of Pentagon excess to towns across America. At the hearing, Sen. Paul said heavy-handed use of force by police in Ferguson was “thoroughly un-American,” and that the Pentagon’s 1033 program should be shuttered. Sen. Claire McCaskill (D-Missouri) said the committee’s investigators found that more MRAPs were now in the possession of local law enforcement than the National Guard, and that 36 percent of surplus military equipment given away by the Pentagon was either new or unused. The committee is considering legislation to restrict all three programs - those of the Pentagon, DOJ and DHS - and close loopholes that are not addressed by the White House review. Despite acknowledging flaws in the programs, all three witnesses at the Senate hearing said the military equipment has been useful, from saving police lives to helping pursue terror suspects such as accused Boston Marathon bomber Dzhokhar Tsarnaev. Sen. Tom Coburn (R-Oklahoma), though, pointed out that Tsarnaev was found by a Boston homeowner, not law enforcement. Meanwhile, as RT has reported, powerful police lobbies are mobilizing to beat back any anti-militarization sentiment resulting from scenes and accounts in Ferguson. 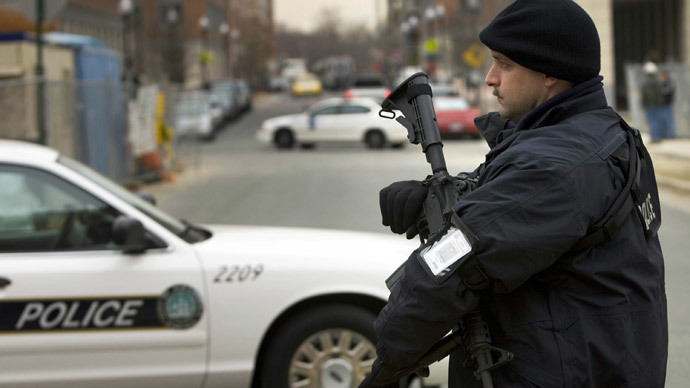 With the mass amount of equipment available to police forces, an aggressive tactical attitude has followed, as shown by the growth of SWAT team units across the US. 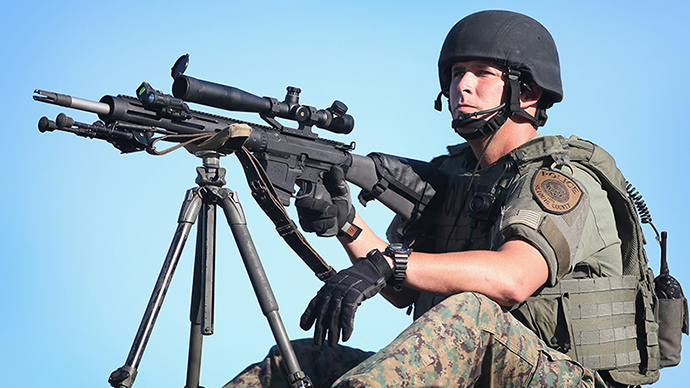 The 98-page report details the militarization of state and local law enforcement agencies, courtesy of expensive federal programs, which are dispensing “weapons and tactics of war, with almost no public discussion or oversight.” Although explicitly aimed at fighting drugs, the strategy is backfiring, sowing fear and discord among citizens, many of whom are starting to fear police as much as criminals. 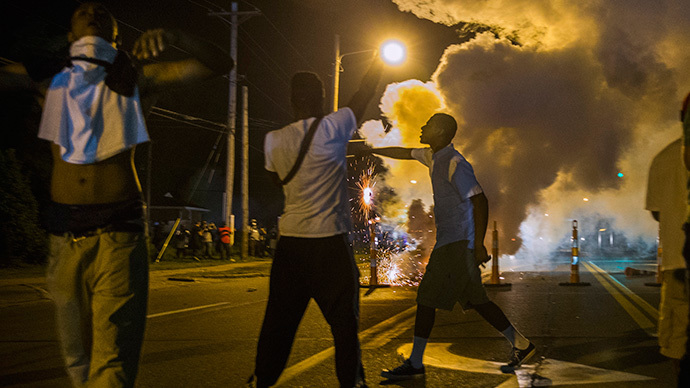 Citizens are taking notice - and action - in areas where tensions are not as immediately high as they were in Ferguson. The city council of Davis, California recently decided to drop the local police department’s Pentagon-supplied armored vehicle following worries from the community that it could be used against demonstrations. 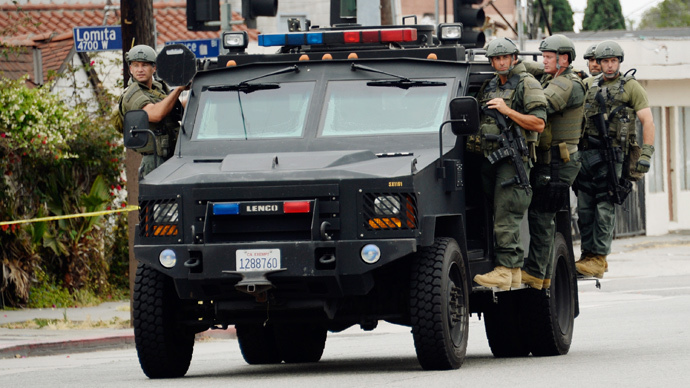 In Salinas, California, residents expressed outrage late last year over a $650,000 heavily-armored vehicle gifted to the police department through the 1033 redistribution program. The truck was used in Iraq and Afghanistan, according to local reports.